I know its been a long time right. Well I'm back! After a long vacation from blogging and I plan on bringing you more blog posts about free items and more in SL. I've missed blogging for ages now and just decided to jump back in and see what happens. I never run out of freebies in my wandering around sl and I really enjoy sharing with others. So enough of me rambling on and on, Lets get to it! I have a totally free outfit for you to enjoy, check the details below. 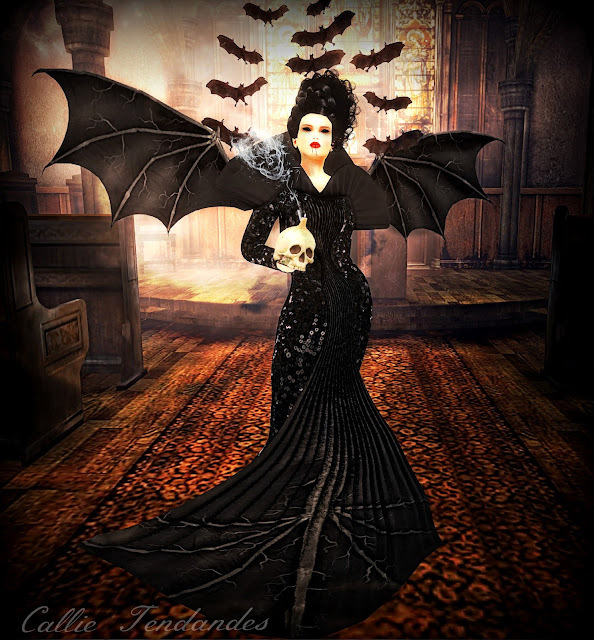 Eyes + Head: "CATWA - Catya v3.0"
Eve Mesh has released this wonderful outfit and legs add-on for Halloween. The legs work with the Eve Mesh body which I'm wearing in the photo below along with the Beta Mesh head release. I've been a long time user of the body and Love it!. If you're a member of Eve make sure to head to the shop to find your free gift, the spiders for Plupy and Slim body. Also I'm excited to be wearing the New Release from Modish. The designer released a LOGO head applier and after trying the demo I found that it works for my Eve Beta mesh head. Try the Demo and see what you think. Enjoy and Happy Shopping. Sharing with you today another outfit for your seasonal fun in SL. From VIPs Creation, The Darkness outfit comes with gown, wings, bat friends, red lipstick and more. Glam up your spooky night out or vamp it up. You can do so much with this one. "SL STYLE Line" ITSELF DOES NOT COLLECT ANY OF YOUR PERSONAL DATA. New Citizens Inc Classes - How To's and more! Hello, I'm Callie. I've been a SL resident for many years and love exploring and creating in SL. I enjoy blogging fashion from the second life grid. Sharing with the readers Hunts, Events, New releases, and the random freebie.